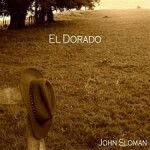 Share the post "Album review: JOHN SLOMAN – El Dorado"
John Sloman is known to rock fans of a certain age for his singing in Lone Star and the ‘Conquest’ album by Uriah Heep. He has released a series of solo albums starting with his 1989 debut ‘Disappearances Can Be Deceptive’ and you can still download for free his 2016 album ‘Don’t Try This At Home. Needless to say this is a very personal album and one which John Sloman has put a lot of effort in to produce a fitting tribute to his brother Phil. John Sloman still has his powerful vocal range, one minute giving it a blues holler on ‘Down To Memphis’, then a heartfelt vocal on ‘One Wish’, a song that brings a tear to the eye of the listener. It is the musical styles on offer that are a delight, with the country/Americana ‘If I Live Through This Night’ a real treat on the ears. I would bet a fair few Nashville based songwriters wish they had penned a tune like this. This entry was posted in ALBUM REVIEWS, ALBUM REVIEWS (Mobile), All Posts and tagged album, Americana, blues, country, El Dorado, former Uriah Heep, gospel, Lone Star, melodic, review, rock, vocalist. Bookmark the permalink.